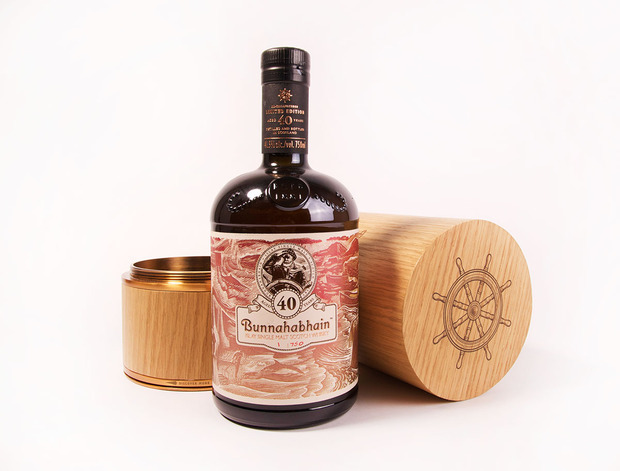 Quietly hidden for over 40 years within the prestigious Bunnahabhain distillery on Scottish island Islay's northern shore, a long-forgotten maturation continued to develop. When reviewing ledgers dating back decades, master distiller Ian MacMillan uncovered a missing series of Turney casks considered by some to be the finest oak casks ever made. Much to his surprise, the casks were filled with maturing malt whisky. 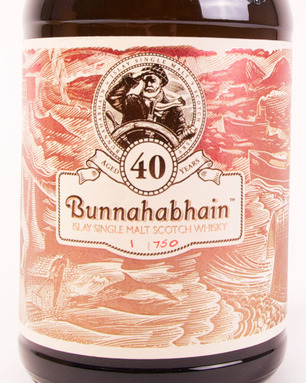 This significant discovery has lead to Bunnahabhain's latest release, a one-off rare single malt that will delight not only fans of the 130-year-old distillery, but scotch drinkers everywhere. Coppery gold in color, the "40 Yo Islay" carries a rich complexity, with honey and ginger, spicy and nutty notes, and even a hint of sea salt. Lingering citrus and a tropical fruit bouquet leave a vibrant finish, with the latter pertaining to its time spent in the sherry wine oak casks. This all begets sheer drinkability and a lightness on the tongue. Unlike other distilleries in Islay that focus on peatiness, Bunnahabhain embraces a less-smokey taste, yielding an ease to the alcohol. Its entire flavor profile delivers all that—and a good story as well. It is nothing short of a treasure for connoisseurs. This run is limited to only 750 bottles globally, with 212 in the US. Each is individually numbered and delivered in an oak gift box. Renowned illustrator Iain McIntosh was commissioned for the specially designed labeling, which carries secrets itself. 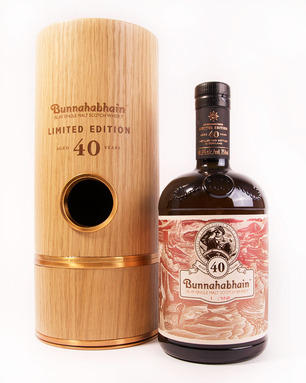 You can purchase Bunnahabhain 40-Year-Old for between $2,800 and $3,200 at select retailers.